Preface: The first five rows were already filled when I arrived at Cubberley Auditorium at 7:20 pm. I found an aisle seat in the tenth row and began reading Collins' Poetry 180, an anthology of contemporary poems which he selected. This was the only Collins' book left at the Stanford Library. All his other eight poetry books were checked out. As the U.S. Poet Laureate, Billy Collins initiated a poem-a-day program with the Library of Congress. Poetry 180 with its website is designed for high school students to read a poem each day of the 180 days of the school year. The first poem in this anthology is Billy Collins' "Introduction to Poetry" a wonderful way to get kids to appreciate poetry for its freshness instead of inducing fear in getting its meaning. In this respect, Collins has selected poems that are accessible at first glance so students will love reading them. It's 8 pm and the auditorium is packed to capacity with students sitting on the floor in the aisles. Prof. Eavan Boland, Director of Stanford's Creative Writing Program introduced Prof. Ken Fields, who introduced Billy Collins. 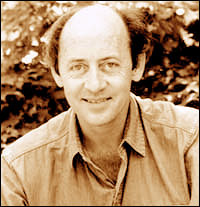 Fields said that Collins' poetry books outsold many fiction writers "Billy Collins quotes like a musician, conveys the zest of experience." Collins thanked Fields, saying "your introduction could be broken up into poetry." Collins then read 22 poems with much humor, drawing continuous laughter from the crowd. The audience applauded after each poem and gave Collins a rousing standing ovation at the end. A short Q&A session followed, then several students went up front to have their Collins's books autographed. Collins autographed the ad with his photo in my copy of the Stanford Daily as well as the Poetry 180 which I checked out of the Stanford Library yesterday. Here is an article about Billy Collins' Reading from the Tuesday Nov. 11th issue of the Stanford Daily. My notes are below. Collins' reading inspired the following poem "Pondering About Poetry After a Billy Collins Reading at Stanford". I wonder how you're going to feel. the stone caught in the heart of her poet lover. (3) I was not afraid of coyotes or bears when I was a child. I was afraid of furnitures, those knotted faces in pine and oak. (4) It's been said that 300 sheep were used for Gutenberg Bible book covers. (8) Yeats wrote "The Wild Swans of Coole" . He counted 59 swans and they took off. there's a bachelor in the group, or a widow, or widower. when I went picking wild strawberries. (10) I was visiting a friend living in Vermont. There is just no way you are the pine-scented air. and the basket of chestnuts on the kitchen table. and the blind woman's tea cup. But don't worry, I am not the bread and the knife. not to mention the crystal goblet andsomehowthe wine. side by side beneath a slab of smooth granite. while my mother calmly tells him to lie back down. (20) This is a spoof poem on our obsessions to decades. It's a 70's thing or a 50's thing twinge of nostalgia. Remember the 1340's? We were doing a dance called the Catapult. the ones with unicorns and pomegranates in needlework. and at night we would play a game called "Find the Cow." Everything was hand-lettered then, not like today. of rival baronies and conquer one another in cold rooms of stone. while your sister practiced the Daphne all alone in her room. We borrowed the jargon of farriers for our slang. These days language seems transparent a badly broken code. The 1790's will never come again. Childhood was big. and write down what they saw in their journals without speaking. Our collars were high and our hats were extremely soft. We would surprise each other with alphabets made of twigs. It was a wonderful time to be alive, or even dead. I am very fond of the period between 1815 and 1821. Europe trembled while we sat still for our portraits. berries and glided through afternoons in a canoe. Even this morning would be an improvement over the present. and silver the limbs on the rows of dark hemlocks. rushing over the stones on the bottom of a stream. a dance whose name we can only guess. Q: How do you pick a synonym if you need an 11-syllable word? A: Flammable and inflammable. Use a thesaurus. Q: Has anyone considered you a clown? A: Should I take this as an insult? Many are shocked to think of poetry as humor. brought it back. I don't think of myself as a Bozo. Q: What can you say about poetry in education? contests. Children 8-9 years old are uninhibited in their writing. 12-13, they go underground through a tunnel of hormonal change. in a spot what's the theme? what's the meaning of this poem? teacher explained it I would raise my hand "It's the quest"
When the teacher said no, I came up with "The search for the lost father"
and so on. Just guessing and not having a clue whatsoever. Q: Do you have any favorites of your own work? at home, hit me over the head! Q: Why do we have to pay a Poet Laureate? is going to waste. The Huntington family funds it a pittance. is to acknowledge the culture of poetry. Only poetry has this title. It's Anglophilia and has a nice ring to it.  You Are Not the Pine-Scented Air, O.K. ?